Morro Bay BEAUTIFUL has operated as a not-for-profit, volunteer organization, for the purpose of preserving and enhancing the beauty of Morro Bay, California. Our community projects range from litter pick-up, to tree and shrub planting, to art projects. We are truly a grass-roots organization, with the vast majority of our projects originated, funded, and executed by our members. We invite you to explore our web site and learn more about us. 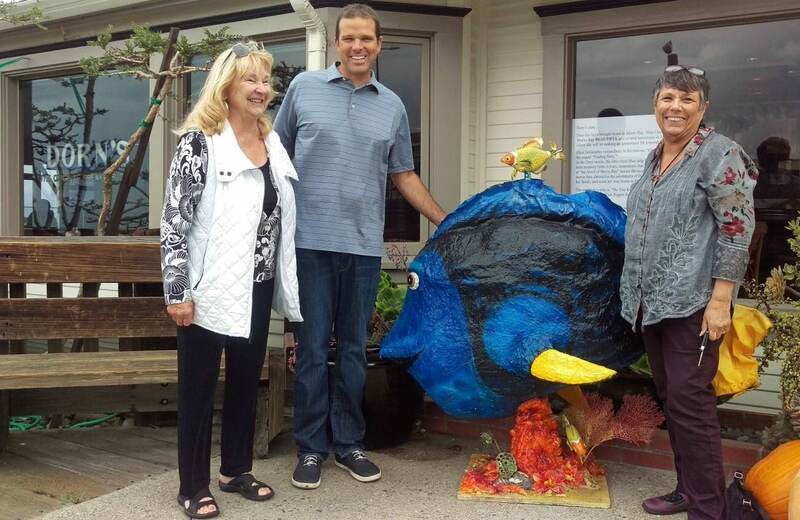 Dory has been brought home to Morro Bay, from Cambria, by Morro Bay BEAUTIFUL and several businesses in Morro Bay, where she will be making an appearance for a month at a time. In the Dory movie, the little royal blue tang fish with bad short-term memory (who is lost), remembers that her family once lived at “the Jewel of Morro Bay” across the ocean in California. The movie then chronicles the adventures of Dory and friends to find her family and work her way home to Morro Bay. The sculpture’s title is, “Do You Know the Way to Morro Bay?” and was created by Tish Rogers for the Scarecrow Festival in Cambria. MBBeautiful saw her, loved her and brought her home.